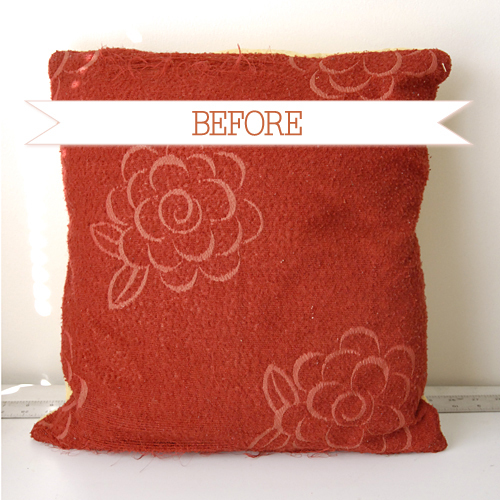 The pillow was looking incredibly ratty. I’m not so sure the fabric was meant to be used for a pillow. In fact, I’m not quite sure what that fabric was meant to be used on, it has torn & worn down so quickly. 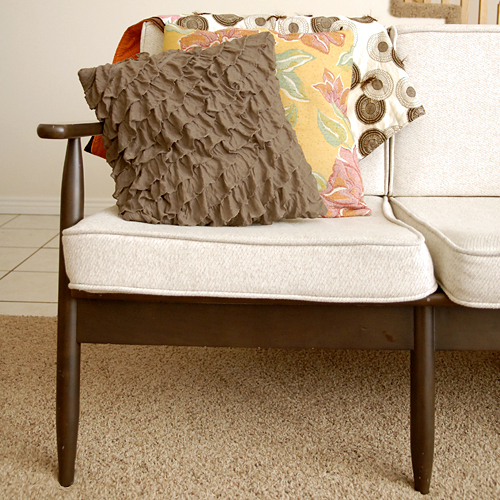 It looks pretty ratty on our couch & it’s time to recover it. 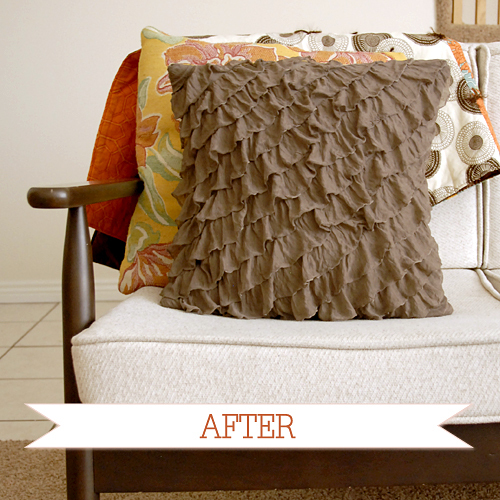 Gosh, it’s time to recover all of the pillows on our couch. I’ve had this ruffle fabric for a while & I’ve had a hard time thinking about what to do with it with my belly bump & all. It would make an adorable skirt, so perhaps after this baby comes & my baby bump goes away I’ll get around to making one. For now, I think it’ll work spectacularly on a pillow. I’ve also been thinking loads about the color gold, especially since two of my friends (Susan & Annie) are currently obsessed with gold leather. I sort of giggled when I found this gold fabric in my stash. It’s gold silkscreened brocade. Perfect right? I think it goes smashingly with my angel lamp. 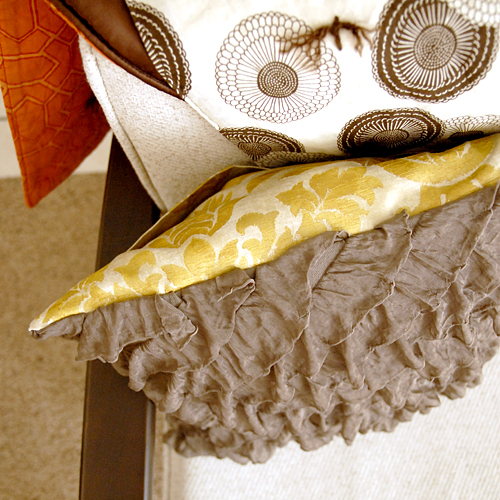 When constructing the pillow, I wanted to do something a tad different with the ruffles, so I cut the fabric on the bias. I love what it does for the pillow! I also love the contrast of the matted ruffles & shiny print. I think this pillow will prove to be the inspiration for decorating the rest my living room. We’ll see. I am pretty anxious to get the house settled & together. I think matching skirts or dresses for my girls. But that pillow is quite tempting to copy. I just might have to do that. It’s ridiculously cute! I would definitely have to copy you and make some pillows, but I would also add it to the bottom or top of some curtains for my room. So many possibilities! I’d use this fabric to add a touch of awesome to a crib bumper I’m making. not for me …. not for a while. but still, love the fabric!! I’d add the ruffles to a coat I know I’ll be using soon. I would totally make a skirt for next spring/summer and then dream all winter of the day that I will get to wear it! Well, I’m pretty plain and would just love a ruffled skirt out of that fabric. (For me!) That smoke color is just gorgeous for autumn and winter, no? I think I would need to make my little Anne a skirt, or even a whole dress for my sister’s wedding. Such fun fabric! Totally make skirts for my toddler! If I had one yard I’d buy another yard and make myself an amazing skirt! How could I not make a skirt out of that? So beautiful. That or use it on the front of a tank. The smoke is my favorite color! I would definitely make a skirt – I get to wear them to work every day, so a ruffled one would be lovely! ooh, i’d want to make either curtains/drapes or a dress out of the ruffled fabric. I would probably cover a pillow like yours. Or maybe a dress for my little girls.